Uvi Poznansky wears a coat of many colors. Originally from Israel where she studied Architecture and Town Planning then moving to the US where she studied Computer Science and became an expert in Software Engineering, Poznansky managed to combine the design elements of two studies into unique formats. And she has accomplished the same with the other side of her brain - making visual her ideas (she is an accomplished painter, drawer, and sculptor who has enjoyed exhibitions both in Israel and in California, her present base) and making words in poetry and in short stories and children's books. APART FROM LOVE: Still Life with Memories is an adult romance in five parts, and now Uvi opens a new series – the Ash Suspense Thrillers - that combines the thriller genre with romance. 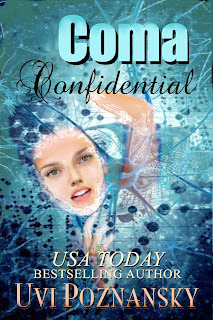 COMA CONFIDENTIAL is Book 1.